Total Charters is a leading charter bus and minibus reservation service in Indianapolis. Looking for a reliable, safe transportation provider? Contact us today at 317-735-6989 for a personalized quote! Book with us for an easy and stress-free experience on your next trip. At Total Charters, we make sure that every reservation agent is trained to make the most of every call, getting you exactly what you need for your trip. With us, you’re able to book the most modern charter buses and minibuses on the market, all fully-equipped with exclusive amenities. Safety is always a large concern with our passengers, which is why we ensure that every driver passes a background check and that every private coach goes through a thorough safety inspection. Schools, churches, corporations, and teams alike all love the attention to detail that we provide. Change the way your group travels by booking with Total Charters today. We’re always available to take your call and provide you with a free quote at 317-735-6989. Don’t miss all that Indianapolis has to offer due to traffic, getting lost, or difficulty finding parking-- let Total Charters handle that for you. Catch a race at Indianapolis Motor Speedway, take in the views at the Soldiers’ and Sailors’ Monument, or explore the NCAA Hall of Champions knowing that your ride is taken care of. Your trip’s experience will be brought to a new level when you can rely on a professional to handle it all. For outdoor enthusiasts, Indianapolis is home to a variety of beautiful parks to explore. Pack your hiking gear into your bus’s ample storage space, and enjoy the beautiful scenery of Fort Harrison State Park, or enjoy a gondola ride in White River State Park. Whatever’s on your itinerary, we’ll get you there safely. Cheer on the Colts, Pacers, or your favorite local team with the ease of a charter bus rental. Whether you’re a die-hard fan or a sports team, a bus rental makes getting to your next sporting event easier and more comfortable. Store all of your tailgating essentials, sports gear, and personal belongings in storage bays beneath the bus and overhead bins, leaving you plenty of space to spread out. Coaches and athletes prefer taking a charter bus to their next away game because of the comfort and convenience it provides. With air conditioning, reclining seats, and TVs with DVD players, the whole team is able to relax and rest before heading to victory. Plus, without the need to worry about transportation, the team can bond and socialize with one another. Keep your event organized and on-time with luxury, clean charter bus rentals. From professional conferences at the Capital Conference Center to unforgettable weddings at the Marvis Arts & Event Center, Total Charters is you go-to for efficient shuttle services to and from the event. Allow attendees to relax and enjoy the event without dealing with navigation, hectic event parking, and congested traffic. Safety will always be our number-one priority, especially when it comes to students. Total Charters will make sure your charter bus rental for your field trip to the Indiana State Museum or the Indianapolis Zoo is safe and reliable from the beginning until the end. With on-board restrooms, TVs with DVD players, and comfortable seating, students and chaperones will have the best ride of their lives without the need to stop. 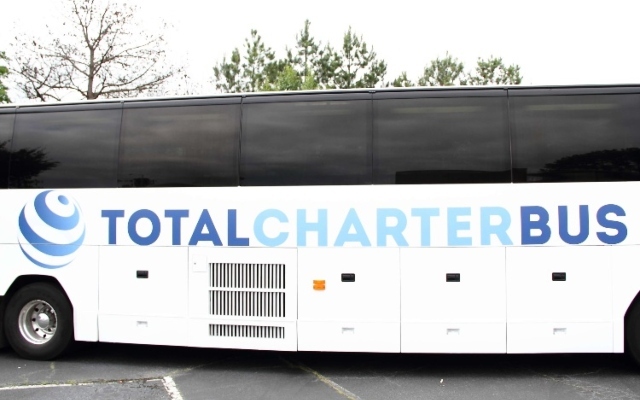 For total charter bus rental services in Indianapolis or in nearby cities such as Bloomington, Chicago, Detroit, or St. Louis, you can rely on Total Charters. We've gained experience in servicing a variety of events, meaning we're always able to find your group exactly what you need. Our reservation team is available 24/7 at 317-735-6989-- call us to book your own bus today!